This scene has two prominent subjects. 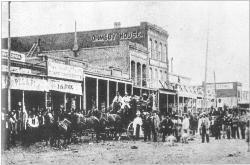 The first is the Ormsby House hotel, which dominates the background. 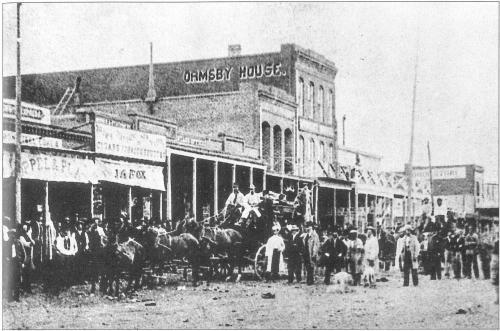 The Ormsby House was built at the corner of Second and Carson streets in 1860 by William Ormsby. Three years later it has already gone through two expansions, the two-story and three-story buildings you can see rising up from the storefronts. But the Ormsby House still had one more expansion to go, a three-story "skyscraper" that would soon rise out of the original hotel building, where the white railing is. The other subject is the Wells Fargo stagecoach, posed in the middle of the muddy street with half the town standing around to get in the shot. Source Caption: Carson City as it looked at the corner of Second and Carson streets in 1863.